Employee engagement and talent retention go together. Now that a new generation of employee is entering the workplace, how are engagement strategies the same of different? A Gallup study found that only 13 percent of worldwide employees felt engaged at work. So what does this mean for the 87 percent who do not feel engaged? They’re feeling disconnected from their job, the company and potentially fellow employees. Considering how the workforce is changing to attract talented Millennials and Generation Z employees, figuring out which ways to build successful employee engagement has become a top priority. It’s not just about making an employee happy so they don’t leave. They also need to feel like they are integral part of the business. While both have different needs as workers, one thing remains the same. Leaders drive employee engagement through their own behavior and strategy. An employee who is productive and happy at work will produce better results for the long-term. 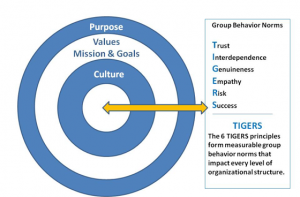 A successful business culture that supports high performance and employee engagement endorses group norm behaviors that are linked to six research-based principles. The six principles are trust, interdependence, genuineness, empathy, risk and success. These six principles are measurable in group behavior. They are also important to successful leadership. Leaders who build high performance work groups while taking into account generational differences model behaviors that build and sustain the six principles. The rewards for doing so improve employee engagement, productivity and the organization’s bottom line. What are companies actually doing and calling it employee engagement? About 62 percent of employees are open to a new job opportunity. This is according to, WeSpire’s seventh annual, State of Employee Engagement report. One of the report’s findings is that leaders are offering employee incentives in order to get them to stay for the long haul. While incentives are welcomed, they only contribute to temporary employee happiness. Make no mistake; most people appreciate more goodies at work. Zappos has the right idea, for example, of offering laundry pick up and return services at work. It saves employees time so they can have more fun on their days off. However, engagement in its purest form is how much someone cares about their work, their co-workers and their organization. The path to caring is not paved with chili dogs and free pizza. You can’t buy love and loyalty when workforce behavior wipes out everything you do. For example, Harvard found that people are leaving their jobs because they simply hate their job and hate coming to it. This is a fundamental retention issue in its most raw sense. Engagement, on the other hand, is all about employees loving the work they do and the organizations they work for. Harvard’s chilling findings suggest that disengaged employees are remaining at a position for a certain amount of time until they ultimately move on. No financial incentive with keep employees in jobs they do not like and with companies they do not respect. Perhaps the organization has communicated very clearly through deeds, behavior and attitudes that employees are a necessary evil and the whiplash effect is that talented employees leave. 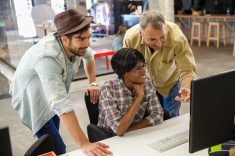 How do Millennials approach employee engagement? For Millennials, more is needed than a ping pong table in the break room and recreational gym access. About 36 percent of Millennials report that they would leave a job if it did not provide learning opportunities. To top it off, there’s a huge stigma surrounding the Millennial work ethic. Although Millennials have proven themselves to be gifted, they’ve been ridiculed by their predecessors for some very sensible business growth desires. They want to be mentored, coached, trained and included in team projects. Instead of waiting and waiting and waiting in organizations to be trained, mentored and coached, they would rather quit than become disengaged. Unfortunately, lack of proper employee engagement leads to poor employee retention. What is needed by Millennials are leaders who understand the value of training and employee performance development. Unfortunately this type of leader is still a rare breed, but is emerging from the Millennial age group. If you do not have Millennials in your leadership pool, this is a serious mistake. For example, Millennials shy away from engagement strategies that are competition-based. Create a competition at work that pits one employee professionally against another, and wait for the yawn. They want leaders who motivate with flexible work schedules, who facilitate work-friendships and who provide team performance opportunities. This means leaders need to tap into effective team process and group maintenance skill development and watch this age group come alive. In order to help Millennials advance, leaders must demonstrate that they can relate to being connected to friends at work and be willing to performance coach or move talented Millennials into these positions and give them support. How does Gen Z approach employee engagement? While Gen Z also wants a flexible work schedule like Millennials, Gen Z also requires more freedom as an independent worker. Many have a more independent rather than interdependent work preference. They also score lower on empathy. This means they will have a harder time resolving conflict, listening to understand and serving on planning projects or cross-functional teams without training. They must learn how to work on teams in ways where their individual and entrepreneurial efforts merge well with the team process. For a generation that is less skilled to work in groups, Gen Z’s version of employee engagement includes actually negotiating for better benefits and work autonomy. They are also innovators. Because Gen Z navigates through the waters of innovation well, they’re going to be more prone to using it. A good leader ensures that Gen Z has access to the digital solutions that makes work easier. How can managers work on their leadership skills and assess employee engagement? An Aon Hewitt analysis found that companies with strong financial results are ones that focus on leadership through employee engagement from the very top. That means everyone is trained the same way in order to better benefit all employees. When managers are engaged, they build better teams. Those teams lead more successful projects with a strong investment return. Leaders who demonstrate honesty and trust through sound communication practices build employee engagement. They don’t micromanage. They guide and then get out of the way. Therefore, it’s important that leadership strategies are measured by outcome. This means that senior leaders must add employee engagement to their score card. Leaders who connect with their employees create high-performance teams in order to push employee engagement to the next level. Whether you’re looking at a Gen Z or Millennial employee, connecting with employees is a core strategy that engages both age groups. How innovation effectively changed the way leaders consider employee engagement. Because time doesn’t stop, neither does the way we innovate for better leadership employee engagement techniques. Without an engaged workforce, a company isn’t sustainable. Here are some key ways that leaders can improve employee engagement. Goals should always be clearly defined. Transparency carries a business for the long-term. Leaders must communicate and explain their vision and the bigger picture. When everyone has the same understanding, things get done faster. Procedural conflict is minimized. Also provide a personal development plan for employees so it’s possible to track their skill growth over time. When expectations are clear from the beginning, it’s impossible to misconstrue them. Both success and failure must be acknowledged. Business operation is a journey. Keep track of everything that happens. Then communicate it clearly and with transparency face-to-face. While both generations are tech-savvy, that does not mean that they don’t thrive off of human interaction. Other ways leaders facilitate employee engagement. Gen Z employees are avid researchers. Therefore, it’s crucial to ensure that they are not underestimated. Give employees the option to take the time to learn a new skill. 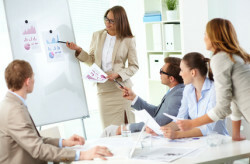 With micro-training, an employee need not appear in a classroom. They can learn on line with a good interactive program. Give employees the tools to succeed. Gadgets and technology fall under this category. The bottom line is that technology has to be embraced by business to thrive under both the Gen Z and Millennial generations. Provide adequate direction and structure. Both generations want clear direction and structure in work. Provide training with incentives. Soft skills such as goal-setting incentives, time-management programs, leadership skill development, access to knowledge-sharing and training resources are all engaging to these employees. Encourage employees to get in on a piece of the action. If employees feel that they are a part of your team, they will be far more productive employees in the long run. Offer mentorship programs or other leadership incentives while pushing senior leaders to the front line of employee engagement. While leadership engagement strategies might be different between Millennials and Gen Z, it’s still a core skill that should be adopted by all senior leaders. Without proper employee engagement coupled with behaviors that support trust, interdependence, genuineness, empathy, risk and success, a business is going to have problems engaging and retaining talented employees. To, make an employee feel like they are truly a part of a powerful team, good leadership is critical for both generations. This means that it’s long overdue for leaders to include employee engagement on their score card. Employees are looking for foolproof strategies. Give them a detailed plan and watch who steps up to the plate as loyal and potential future leaders. Care to dig deeper into this conversation on Employee Engagement? The following resources add value to this conversation. How will Gen Z Change Workplace Culture Created By Millennials? Copyright TIGERS Success Series, Inc.
TIGERS Success Series provides a Manager Facilitator training with a tool box that engages employees to identify the group norms that improve both department and company work culture. It helps organizations to re-engage employees, resolve conflict behavior and builds work relationships. These same resources and tool box can be used to onboard new employees and contractors onto existing teams so behavior is understood and normalized from the get-go. The training and tool box are brought to you when eight or more of your managers are enrolled. Schedule a business call to learn more.